From the earliest days of Guiding, alongside all the outdoor adventure, the arts also featured in the programme, whether it was performing round the campfire, making handicrafts, or putting on entertainments (often as a fundraiser). Dance, too, featured very significantly in early Guiding, reflecting the revival of interest in folk dancing in society in general at the time. Here I will take a look at the various arts and how they have featured in Guiding. One of the earliest arts to feature in Guiding, was singing. From the start of the movement, it was common for Guides who gathered round the campfire or round the clubroom piano, to sing - the problem was, sing what? In the 1910s, the 'popular songs' of the day were mainly the famous 'music hall' songs, with jolly choruses that everyone knew and could sing along with - but in most cases the verses of these songs were not at all appropriate for innocent girls to be singing, so songs had to be found which would be more appropriate, and quickly! Thus, in the early years of Guiding, songwriters were encouraged to write and publish 'suitable' songs for Guides, leading to productions such as the 'Song of the Girl Guides' or "The Brownies' Toadstool". Most of these songs were published with full piano arrangement, as was customary in those days - not a problem in an era when most girls were taught to play piano to some extent - and with actions which could be used in stage performances. 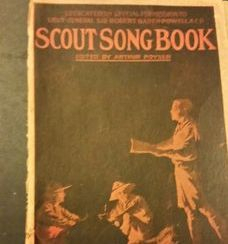 The work which Arthur Poyser was doing for Scouts with his 'Singers and Players' was also utilised as a source of suitable songs for Guide use. Soon suggestions of approved folk songs were being made in the magazine, and paper leaflets of 'Camp Fire Songs' were being published by headquarters. Many publishers jumped on the bandwagon too, in producing booklets of songs labelled as being for campfires, or for Scouts/Guides, whether in conjunction with headquarters or not. Use was also made of early Scout publications such as the 'Hackney Scout Song Book', produced as a memorial to those members of the Hackney Scout Area who had died in service during World War 1. During the 1920s and 1930s more song books were being published in both Guiding and Scouting which were used by both movements, and 'community song books' were being published by other organisations too. 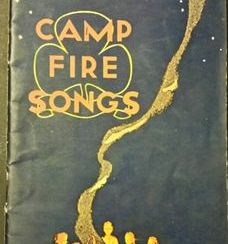 As training in Guiding developed, with residential training events being held, so trainees were encouraged to start their own 'campfire song books' - hardback notebooks where they would write down the lyrics of the newly-learned songs at campfires and trainings, which they could take back to their units and Districts - and thus many new songs were learned and shared orally. These songs tended to be a mixture of folk songs from around the UK and beyond, and new words put to existing well-known tunes (there was much anguished debate in 'The Guider' about the appropriation of hymn tunes for this purpose). Many of these hardback notebooks still survive, and give a fascinating idea of the sort of songs units sang in different decades. Music Advisers were appointed to encourage singing within Guiding, and to promote 'appropriate repertoire', prominent among these being Mary Chater, who wrote many songs for Guides. Songs, and even pull-out song supplements, were published in "The Guide" which people were encouraged to add to their homemade 'campfire song books'. For the Brownie section, however, singing tended to be limited to nursery rhymes and traditional children's singing games such as 'nuts in May', 'dusky bluebells' and the like, and other resources were few. And of course, with so many handwritten resources, and songs being taught orally, there was a lot of scope for words to be misheard and tunes mis-remembered, meaning that different versions of the same song still crop up around the country, and it is often impossible to confirm a 'correct' or 'original' version! 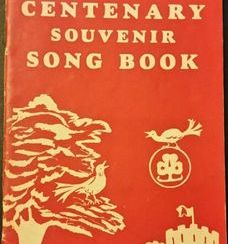 Post world war 2, the publication of CHQ songbooks gathered pace, with the likes of the 'Centenary Song Book', the 'Campfire Song Book' and internationally, the original slimline 'Chalet Song Book', and Canadian 'Jubilee Song Book' which helped to spread repertoire through the UK and the English-speaking contries abroad. The 'Baker's Dozen' and 'Brownies's Dozen' books for Brownies also appeared. Qualifications were introduced for leading singing sessions for Brownies and for Guides, in recognition of what a skilled job 'campfire leader' is. The late 1960s and 1970s saw an increased interest in folk music in popular culture, with a large number of folk groups springing up, and significant amounts of television coverage for folk music - and Guiding followed suit with several 'Folk Fest' events being held, and many Guides and Guiders were encouraged to bring guitars to campfires. Accoustic Guitars became a feature at almost every campfire, aided by the production of a teach-yourself book, and the Diamond Jubilee songbook appeared. Books aimed at encouraging music in the Brownies section, including 'Music Time for Brownies' and 'Musical Fun in the Brownie Pack' helped to broaden the repertoire available for that age group, and encouraged the use of percussion and instruments, especially descant recorders (which were increasingly being taught in primary schools). 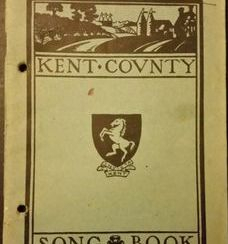 In the 1980s there was a flood of song books, especially by Sue Stevens (who did a lot of work to promote music in Guiding from her base at Foxlease), and throughout this time songs continued to be published in 'Today's Guide' and 'The Guider' to cut out and keep, many either composed or arranged by Sue. In recent years Anglia Region has produced well-filled song books, and CHQ has published some resource books such as the recent "Let's Hear It For Music", though nowadays these tend to focus more on music and rhythm activities, rather than specifically on song repertoire. Singing Circles sprang up at each of the training centres, helping to spread repertoire quickly across the UK, and to support song-leading in their areas - and some Counties have developed groups too, some of very long standing and others in recent years, led by enthusiastic volunteers. The singing circles have helped to import useful books from other countries such as 'around the campfire' from Australia, and 'campfire activities' from Canada. In the 2000s and 2010s, the focus on music in UK Guiding has been less on campfires and participatory music, and more on non-participation music events such as 'Big Gig/Tartan Gig' and 'Wellies and Wristbands/G in The Park'. The music qualifications were withdrawn, and few new resources have been published in recent years, other than by Anglia Region. But the various Singing Circles, established around the UK (especially during the 1980s but in some cases many years beforehand) continue to work to share new and existing songs with Leaders, and encourage campfire singing in units . . . and at most large Guiding events, one of the items on the programme will still tend to be a campfire . . . In the years that Guiding was starting, there was a great revival in the UK of 'folk dance', especially those dances collected by Cecil Sharp, in England, and published by him and by the English Folk Dance Society which he was so heavily involved with. With this revival, there was a great encouragement of folk dancing in Guiding, and Guides were encouraged to learn 'Gathering Peascods', 'Sellengers's Round', 'If All The World Were Paper' and the like. Wind-up gramophones were taken to camps, and the dances were performed at unit meetings and in concerts. In Scotland there was also Scottish country dancing, with units often entering dance teams for public competitions, sometimes as Guide teams, but occasionally linking up with local Scout units to create mixed teams, encouraged by the Scottish Country Dance Society. This seems to have continued through the inter-war years but does not seem to have been anywhere near as widespread or popular post-war - possibly linked to changing tastes in popular music amongst the Guide age group. Through the 1970s there was a certain amount of 'expressive dance' and movement-to-music, but generally only in those units where Leaders were enthusiasts, and not widespread. In more recent years dance has been quite limited, with no particular encouragement of it, so beyond the occasional unit disco, singing games for Rainbows or Brownies, or learning a folk dance as part of an international night, dance does not often feature in unit programmes. Some special dances have been written for Guiding, including one in 2010 for Guiding's Centenary year. Handicrafts (now often just known as crafts) were encouraged in the early years of Guiding mainly as 'Spare Time Activities', commonly known as 'STAs'. They were seen as a positive way to fill in leisure time (particularly in the pre-WW2 era where mass entertainment was limited to the occasional night at the cinema, and television was unknown - and where radio could be listened to while simultaneously doing something practical. The aim in those days was for functional output - woodworking, leatherwork, dressmaking, knitting and the like, with the produce either being used, or sold to raise funds, and manual dexterity and artistic skill being developed in the process - although the objects were often decorated too. Although in Scouting there was a big interest in 'backwoods crafts' and 'Indian lore' encouraged by people like "Eagleye" who wrote in "The Scout" magazine about whittling, making furniture from logs and mock animal skins etc, this was less pronounced in Guiding. On the other hand, "The Guide" and "The Guider" magazines regularly featured knitting and dressmaking patterns for garments and for toys, a reflection of the greater handcraft skill that girls had in those days when homemade garments were far more affordable than shop-bought, and few other hobbies were accessible. There were also practical ideas for gifts, such as twig brooms, shell-decorated boxes, passé-partout picture frames etc. During WW2 (and to an extent, in WW1) practicality in handcrafts necessarily came even more to the fore, given clothes rationing and the general shortage of manufactured goods - knitting garments for those serving at the front, practicing 'make do and mend', recycling and remaking old garments for new uses, patchwork, and rag rugs. Toymaking, too, became popular as toys could not be bought, including such things as dolls' house furniture made from matchboxes and conkers, carved wooden spinning tops, rag dolls etc. To an extent, this practicality carried on well into the post-war era - as rationing continued, so too did the 'practical crafts' and there was little 'art for art's sake' done, with craft generally being confined to the Brownie section, other than some whittling or lanyard making for Guides and Rangers. Through the late 1960s and 1970s, however, craft fashions started more generally in society, and then found their way into Guiding with things like macramé and tie dye. Once Rainbows began, they tended to be the main section for crafts - because they had no centrally-provided programme to work on, the Leaders had to come up with original ideas for every meeting of the year, and many of the Leaders had a 'playgroup' background, so inclined towards providing a large number of crafts, sadly sometimes even doing craft most weeks - fortunately in recent years, with the coming of 'Roundabouts', the notion of 'something to take home every week' from Rainbows has been broken, and craft has started to take a more reasonable proportion of the meetings, as being but one of the arts (and the arts only a modest part of the overall programme). In more recent years, as both Brownies and Guides are less capable at sewing and knitting, crafts have again tended to follow wider fashion - hama beads, friendship bracelets, scoubis, loom bands have all come and gone - who knows what the next craze will be! In Guiding, drama has always tended to be centred on the fundraing concert. From the earliest days, units sought scripts to use for putting on performances in order to raise funds (indeed one of the earliest Guiding publications was a collection of 'turns' for Guides collected by Agnes Baden-Powell). Such fundraising was often for unit funds, or during World War 1, for the Red Cross. Throughout the pre-WW2 years "The Guide" would publish scripts for pageants and tableaux, and would publish reviews of play and entertainment scripts available from commercial publishers. Often these would either be symbolic pageants (such as 'the spirit of Guiding' where each of the Guide Laws was represented by a character) or plays showing girls who were Guides knowing how to deal with emergencies while adults or other girls who hadn't the benefit of Guide training looked on helpless. In those days too, the 'campfire skit' existed, but it tended to take the form of serious entertainment - acting out scenes from history or from famous books or plays - and it was not normally humorous. Recitations, storytelling, and monologues were also popular campfire items, and although some would be humorous, a significant proportion were serious. Of course in those days of little mass entertainment, the classic books were more widely read, so the girls would be familiar with the scenes being performed and able to follow the plot. It was in the 1930s that the first 'Gang Shows' were performed - started by 'A Holborn Rover' later revealed to be Ralph Reader, who used his professional skills from the theatre trade to put on a fundraising show for his Rover Scout Unit, it grew to be an entertainment involving Scouts from across London, and eventually to being a brand of show featuring both Guides and Scouts, with Gang Shows being set up in cities and areas across the UK, each with their own customs and traditions, which continue to this day. At campfires, from the 1950s onwards the humorous skit became more common and the serious ones far rarer - and by then the number of Guides who could perform 'party pieces' and monologues was declining - the spread of mass entertainment such as television meant there was less call for home-made entertainment, and fewer people familiar with the classic literature which was previously common currency. 'Community singing' tended to dominate at campfires, with yarns, games and 'party pieces' becoming rare, and sometimes entirely absent, quite different to the founder's original idea of the campfire gathering at the end of the day. Nowadays drama tends to be restricted to the occasional unit pantomime or concert, miming games, and the humorous camfire skit . . .